Colorpop cosmetics has created a spark among blogger and you-tubers now-a-days.. especially their liquid lipsticks ,lipstix and eye shadows are very popular for their amazing quality. But the only drawback is ,these are not available in India and colorpop website also doesn't ship to India. You can only buy these beauties from some Instagram sellers.. Well I got mine from a insta-seller Now Wow Chennai . I got three shades which are obviously their best sellers.. And today I am going to write one of these colorpop lipstix named as Back Up . This particular shade is always out of stock at the sellers.. Let's see how fair is it.. I am in love with this shade from the first sight.. you know love at first sight.. 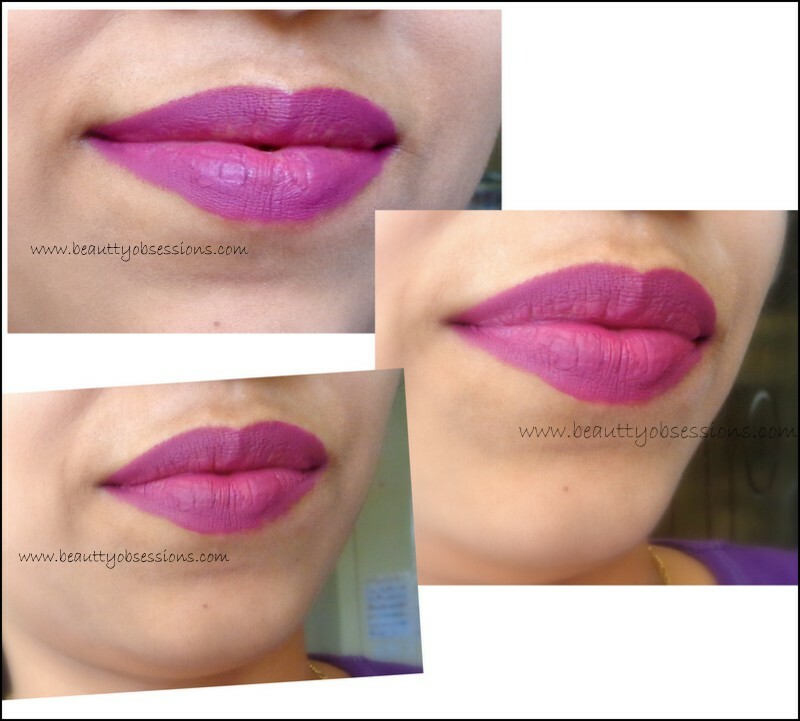 The shade Back Up is a versatile shade .. Actually it is a warm tone purple shade with fuchsia undertones .. Now purple lip shades are very much in trend.. and this one is my first purple shade.. It is not that vibrant eye-catching purple (which you can't wear in the day time functions) but a muted subtle purple which you can carry anywhere without any thought. The shade is so so pigmented. I have applied only one swipe and its done.. No matter if you have pigmented lips or not but it will rock on everybody, every skin tone. The texture is buttery smooth and very creamy to apply. But after few seconds it settles down in a nice matte finish which I love.. It applies very smoothly on my lips without tugging or pulling.. As it is a matte finish lipstick you have to exfoliate your lips (if you have dry lips like mine) before applying it. It is not fully transfer-proof,because it doesn't settle down like the MAC matte lipsticks does. It gives a powdery matte finish. If I am touching my lips even gently, some powdery purple colour transfers on my finger.. But we can't compare it with the MAC ones ,because these are dirt cheap as compare to the MAC ones .. The colour Back Up stays for approx 5-6 hours and sometimes more on my lips with some light snacks meals but doesn't survive the heavy meals. It doesn't fade away completely ,even after fading it gives some light purple-ish pink tints which lasts again for a long time.. The shade settles into fine lines ,so better to exfoliate lips properly..
Packaging wise it is quite good.. It has a pen type packaging with retractable crayon form. The bottom of the lipstix is colour coded which makes you choose the shades perfectly.. 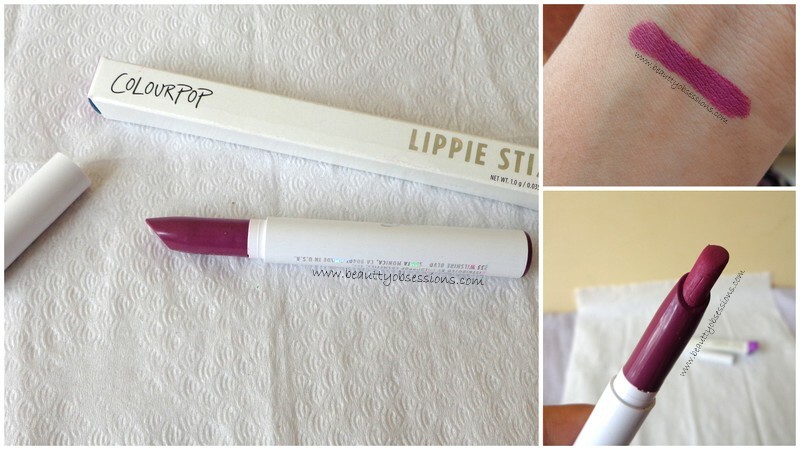 The lipstix again comes inside a cardboard box . I like the over-all packaging.. I will recommend this shade to everyone ( highly recommended) .. If you haven't checked the colourpop cosmetics yet,then move fast and check the swatches. The lipstix range has awesome shades which suits most of the skin tones.. I will personally suggest to visit the insta-seller Now Wow Chennai ,because they have the lowest price on these.. Thank you for stopping by.. See you in my next post..
pretty shade. one of my most fav. Thank you Swathi.. yes I am in love with the quality and they have beautiful shades in the range..
Lovely shade. Need to get my hands on colourpop cosmetics. wow!! soo pretty m a purple obsessed and now this color is in my wishlist. The lip color looks so attractive ! Looks so beautiful on you ! I too love such shades.. Would love to buy it soon! The shade is gorgeous. I've got to try Colourpop lipstix.